We loved this soup. 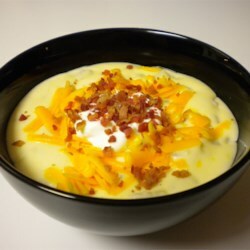 I noticed too that it wasn't as thick as I like potato soup so I added a little cornstach/water mixture and that helped. I did not have onions on hand but I did have green onions so I added those to the potatoes and had them boil with the potatoes( I boiled the potatoes instead of microwaving them), because I do not like crunchy onions in my soup. But it really did taste like a baked potato. I topped it with crumbled bacon and extra cheese. We will be making this allot for those cold winter nights. It is a great comfort food!